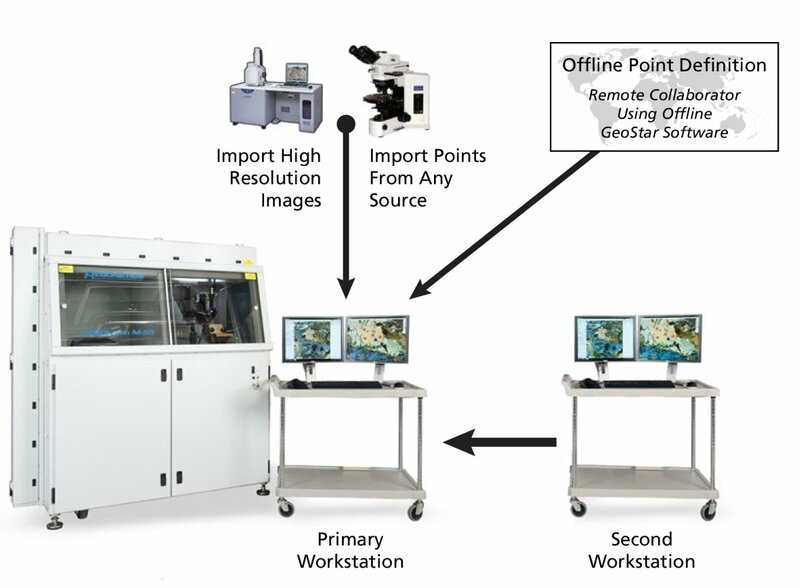 All users are able to install and distribute an offline version of GeoStar, which provides a convenient interface for marking sample imagery with points and paths for ablation. The sample and file are later brought to the laboratory and the sequence imported using the powerful image coordination features. This offline sequence definition saves instrument time and facilitates collaboration with remote colleagues. 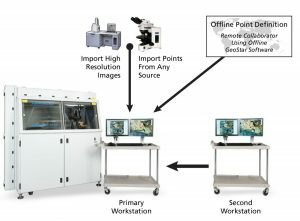 The GeoStar software can also import sequence geometry from external sources. The point geometry, represented using any unit dimensions, can be stored in a text file and then easily imported into GeoStar via a two or three-point coordination method. This also works with sequence files created inside GeoStar, allowing users to return to samples and continue the analysis if the initial attempt was interrupted. One useful application of external point importing is for loading point locations that have been analyzed by an electron microprobe. The XY coordinates from the microprobe can be stored in a text file and then imported into GeoStar, ensuring that the internal standard composition is correct for each ablation point.